5 Key Academic Policies Designed For Your Success! College Students…Is This Your Life Right Now?! Your Civic Responsibility – VOTE! The Add/Drop period occurs each semester, usually during the first week of classes. This tool allows you to “shop around”, for courses, so to speak, to make certain you have the class schedule that meets your academic and personal needs. The Add/Drop period does have a deadline so check your academic calendar and take advantage of adjusting your schedule if you need to do so. In most cases, students select the Pass/Fail option when they don’t want to be burden by the academic demands of a particular course. Receiving a grade of “P” earns you graduation credit and (0.0) quality points. Whereas, if you fail the selected course, then you receive a grade of “F” and it does lower your GPA. Keep in mind that each U.S. college and university has different rules governing student use of the Pass/Fail option. The Course Withdrawal option allows students having either academic and/or personal difficulties to withdraw from a course and/or school completely, receiving a “W” grade for each course(s). Beware… There are deadline, financial as well as academic consequences in selecting this option. Generally, you have anywhere from 6 to 8 weeks from the beginning of classes to assess your particular situation. It does require very careful consideration before making that final decision…good time to chat with your academic adviser. Known by different names at different campuses, the “invaluable degree audit” tracks, in detail, your academic progress. It tracks and monitors your degree requirements including graduation credits earned, courses completed, grade point average, major required courses, transfer credit, and course electives. It is updated every semester. If you don’t have one in your possession now, then get a copy ASAP from your academic adviser or from the Registrar’s Office. Skills, Skills, Skills… The heart of information literacy is the skillful, analytical use and effective management of information resources. Succeeding in today’s workplace requires having a level of proficiency in information literacy practice. Developing Information literacy skills enhances both analytical and digital capabilities. These critical skills are essential for any student to flourish in today’s academic, workplace, and fake news environments. Having Academic Challenges - Need a Second Opinion? You realize during the first week of classes that you registered for Algebra 001 when your math placement test stated Algebra 101. You check the Registration Schedule and notice 2 sections of Algebra 101 are available in the morning and 1 section is available in the evening. You double check with your busy academic adviser via email. The Add/Drop deadline is in 2 days. You get an email confirmation and then, following the Add/Drop registration instructions, you changed classes. Several weeks into the semester, you discovered that the “easy” elective, astronomy, that you added to your schedule is turning out to be not so easy. It’s really more demanding than you had anticipated, elevating your stress levels…not to mention the other work in your GenEd courses. You investigate the restrictions of your school’s Pass/Fail policy and, alas, you can designate the course as Pass/Fail. You complete the sign-up requirements before the Pass/Fail deadline. You’re carrying a full academic course load your second semester – 15 credits (5 courses). You just completed your midterms and learn that you received a grade of “D-“in a biology course. You did well in your other courses. You’re worried that this course will pull down your grade point average (gpa). The biology course only has a midterm and a final. You’re also a financial aid recipient and you have to abide by the federal government’s “satisfactory academic progress” regulation. Withdrawing from the course may be an option, but you’re not sure about the financial and/or academic consequences. In addition, a family crisis is looming on the horizon and you may have to leave school before the semester ends. There is also a deadline to withdraw from a course (s). Time to have a conversation with your academic adviser. During your first semester, you just realized that every semester, you’ll receive an updated degree audit listing your major and graduation requirements, courses completed, grade point average, and other available course/program options. This audit will be quite helpful to you with deciding your course schedule for each semester and monitoring your academic progress. You noticed that your grade point average for your first semester was listed as 2.75. Yet, you received all “A”s and “B”s on your first semester’s grade report. Which means that your GPA should be listed as 3.5. Time to pay a visit to your academic adviser and the Registrar’s Office. You’re unfamiliar with the subject matter in a course you’re taking to satisfy a social science graduation requirement. You have to write a 20 page research paper on a topic of your choice. You’re unsure about what topic to select because you really are having hard time understanding the lectures and the subject matter overall. Also, the language of the assigned text book is just not helpful, often confusing, as is the corresponding course information resources packet. What to do…get thee, ASAP, to a campus reference librarian and discuss your project and how best to accomplish it! 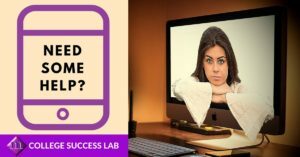 College Success Lab App also available in the Apple App and Google Play stores. Review the above academic policies and associated student scenarios. Go online and check out your campus’ student handbook. Different campuses have different rules! Any of the scenarios sound familiar? Considered some of the possibilities? Then, before making that final decision, check in first with your academic adviser. You’ll be glad that you did! Mélange Information Services, Inc provides educational services (classes, workshops, and seminars) in the following areas of expertise: information literacy, health literacy, knowledge management and workforce development. ©2019, All Rights Reserved - Mélange Information Services, Inc. is a participant in the Amazon Services LLC Associates Program, an affiliate advertising program designed to provide a means for sites to earn advertising fees by advertising and linking to melangeinfo.com.